Patricia Fieldwalker - what more can I say? While locals may not have this name roll off the tip of their tongue instantly, she has sold in Bergdorf Goodman in NYC for over 30 years. Her designs have rocked the runway in Paris and are sold internationally. The Adagio Collection is a favourite among Hollywood glitterati such as Julianna Margulies, Claudia Schiffer, Demi Moore, Michelle Pfeiffer and many, many more. She also has a heart of gold. Her presence at Vancouver Fashion Week was strongly enmeshed with a charity fundraiser for those affected by the earthquake in Japan. Kudos!!! I had the privilege of interviewing Fieldwalker in April 2009 for Vancouver Fashion eZine (folded in April 2012) and for Raine Magazine in February 2012. From first glimpse I was enchanted by her collection and during the interview began to feel our lives had some eerie parallels. She started out as a mother of 3 who created a camisole to wear to an event. I started out as a mother of 3 answering a Craigslist ad from a New York magazine. The response to her initial garment built into a business that grew beyond her expectations. That writing experience eventually led me to Vancouver Fashion eZine, which has exploded to the point where it has taken over my life. She learnt as she went along - lessons easy and hard - and so did I. When she next advertised a sample sale, I think I showed up at least twice, my daughter in tow. I sported a beautiful black and white silk Kimono purchased at this sale to her VFW Wednesday night show and received compliments right, left and centre. At VFW, the next day I was surprised when people continued to come up and mention the kimono. It shows the power of purchasing a truly beautiful garment. What I think Fieldwalker does best is elegance. She takes beautiful silk, cuts it on the bias and creates garments that are flattering for women of all body types. They drape softly around your body and feel amazing to touch. Anything she does in black is probably a sell-out as black and elegance go hand-in-hand. Same for the deep, inky navy blue that graced the runway. On Wednesday night I saw a 2-piece black silk lounge set (middle photo below) that I would happily wear out to any event with a few sparkly accessories. Despite the intense black, it felt effortless and floated around the model's figure as she walked. A stunner! Next is colour. No one picks a better palette than Fieldwalker. Bright and sunny corals, pinks that pop, jewel tones that glow, ebony black and midnight navy used either alone or in eye-catching prints are intuitively chosen each season. This designer also has a knack for combining solid colours or solids and prints - bright pink/orange, lavender/teal and coral/lavender. 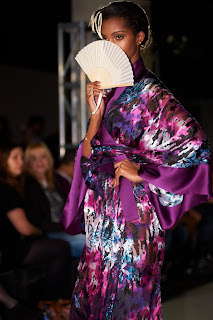 Her great selection of Kimonos show off the beautiful patterned fabric and great colour blocking particularly well. Both short and long lengths are available and they are well suited to be worn to events - something I proved Wednesday. Finishing touches of high-quality french lace in either a matching or contrast colour were scattered here and there through-out the collection. Fun is the final element. Short, flirty lingerie with lots of colour and personality caught my eye. The prints in particular were versatile. I could easily see them walk right out of the bedroom and into the sunlight - think sidewalk cafes, summer get-togethers or a warm tropical resort. We only saw one example, but the Patricia Fieldwalker collection also has stretch lace undergarments that are some of the sexiest I have seen. They can be used simply as invisible undergarments or one can step it up a notch by having them peek out from low-neck tops or letting them be glimpsed through sheer blouses. I am now and always will be a fan of this talented designer. 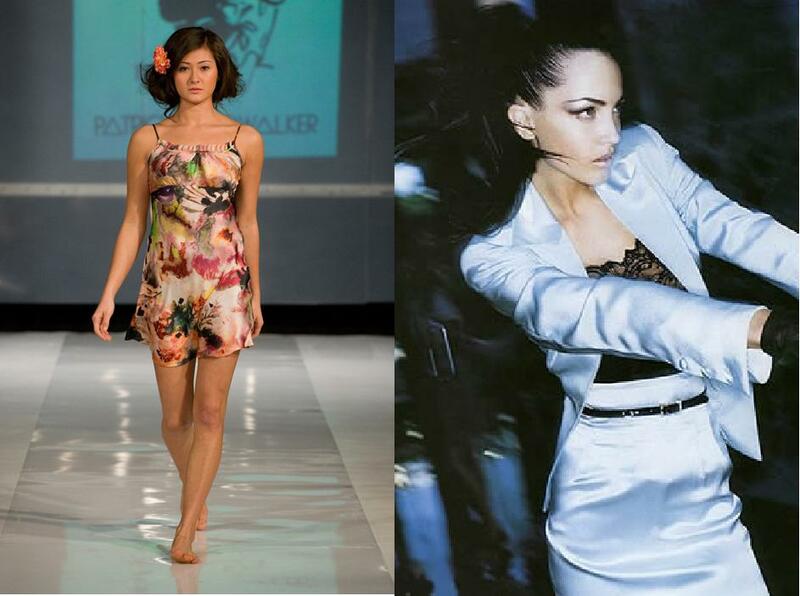 The Patricia Fieldwalker collection - Adagio - can be purchased in Vancouver at La Jolie Madame in Pacific Centre. The designer also offers sample sales and a fall holiday event. For more information such as location in other areas, or to be put on the mailing list, go to www.pfieldwalker.com.